Cash rounding or Swedish rounding (New Zealand English) occurs when the minimum unit of account is smaller than the lowest physical denomination of currency. The amount payable for a cash transaction is rounded to the nearest multiple of the minimum currency unit available, whereas transactions paid in other ways are not rounded (for example electronic funds transfer like credit cards, or negotiable instruments like cheques). Cash rounding typically occurs when low-denomination coins are removed from circulation owing to inflation. Cash rounding may be a compulsory legal requirement if such coins are no longer legal tender, or a voluntary practice where they remain in circulation but are scarce or impractical. Cash rounding ("öre rounding", öresavrundning) was introduced in Sweden in 1972 when 1 and 2 öre coins were withdrawn from circulation, and has continued to be applied at incremental levels as smaller denomination coins have been withdrawn. The current level of cash rounding in Sweden is to the closest whole krona, after the 50 öre coin was withdrawn in 2010. The Reserve Bank of New Zealand used the name "Swedish rounding" in 1990 when withdrawing their 1- and 2-cent coins. In Canada, cash rounding due to the elimination of the penny in 2013 is also called penny rounding. When small-value coins are withdrawn, an alternative to the implementation of cash rounding is instead to increase the minimum unit of account to the smallest remaining currency unit and to round all prices and bank accounts to this value. Whereas cash rounding is an ongoing process, this alternative is a one-time conversion. It was done, for example, when the British farthing was withdrawn in 1960. 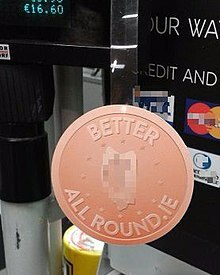 A "BetterAllRound" notice at a cash register in Ireland after the October 2015 introduction of 5-cent rounding. Rounding is applied to the total of a bill, not to the line items on the bill. Typically, the total is rounded to the nearest multiple of the smallest denomination, which may be higher or lower than the unrounded total. Where the unrounded total is an equal distance from two multiples, practice varies: merchants may be required or encouraged to round down rather than up, giving the benefit to the buyer. An equal distance is possible when the rounding interval is an even number. The introduction of cash rounding is typically accompanied by publicity campaigns for awareness among both consumers and implementing merchants; smaller campaigns will accompany the extension of an existing rounding system to a higher rounding interval. Australia 1992 onwards 1c and 2c coins last produced in 1991 and removed from circulation in 1992, though they remain redeemable at banks. Payments completed by cheque or electronic means are not usually rounded, although some point-of-sale systems may round all transactions regardless of tender. Belgium 2014 onwards 1 and 2 eurocent coins are no longer in general use and prices are rounded to the nearest 5 eurocent when paying with cash. Brazil 1 centavo coins no longer produced as of November 2005. Retailers now generally round their prices to the next 5 or 10 centavos. Canada 2013 onward Penny no longer produced as of 2012. After 4 February 2013 pennies no longer distributed by banks. Electronic transactions are still completed to $0.01. Finland 1980 onwards The 1-penni coin was phased out in 1980 and the 5-penni coin in 1990. When Finland introduced euro notes and coins in 2002, cash payments were rounded to the nearest five cents, however one- and two-cent coins remain legal tender. Hong Kong 1989 to 1995 The five-cent coin has ceased to be legal tender in 1989. Hungary 2011 The centesimal subdivision of the Hungarian Forint (the fillér) was discontinued in 1999, and is not used for transactions, but may appear in contexts where precision is needed, such as petrol prices. Cash rounding is done to the level of 5 Ft, which is also the smallest denominated coin available after a new set of coins was introduced in 2011. Full precision to the Forint level remains possible through bank transactions. Republic of Ireland 2015 onwards A National Payments Plan in April 2013 planned "to trial the use of a rounding convention in a pilot project in a mid-size Irish town", with the 1- and 2-cent coins no longer being minted while remaining legal tender. The trial in Wexford was declared successful in June 2015 and rounding to the nearest 5 cents commenced on 28 October 2015. Compliance is voluntary and retailers must make exact charging upon request. One- and two-cent coins remain legal tender, and rounding does not apply to electronic non-cash payments. Israel 1991 to 2007 1 agora coins were removed from circulation on 1 April 1991. Transaction amounts could still be specified to the nearest agora. Cash purchase totals were rounded to the nearest 5 agorot. This system was in effect until 1 January 2008, when the 5 agorot coin was also removed from circulation. Italy 1918 to 2002, 2018 onwards 1 and 2 centesimi coins were last minted in 1918 and demonetized in 1924. All coins smaller than 1 lira were demonetized in 1947. 1 and 2 lire coins were last issued in 1959, then prices were rounded to the nearest 5 lire, although 1 and 2 lire coins remained legal tender. In the early 1990s, 5, 10 and 20 lire started to disappear from circulation, but they remained legal tender, making the 50 lire the smallest commonly used coin, until being phased out in favour of the Euro in 2002. Since 1 January 2018 the Italian Mint discontinued the issuance of 1 cent and 2 cent Euro coins. Malaysia 1 sen coins are still legal tender. Netherlands 1980 to 2002, 2004 onwards In 1980 the production of the Dutch 1 cent coin (0.01 guilder) ceased and the coinage was demonetarised in the same year (at that time no coins between 1 and 5 cent existed). After introduction of the Euro in 2002, the Netherlands used 1 and 2 Eurocents (equivalent to about 2.2 and 4.4 Guilder cents) until 2004. In 2004 the Netherlands discontinued issue and use of 1 and 2 Euro cent coins. The Netherlands did so under pressure from retail businesses, which claimed that dealing with 1- and 2-cent coins was too expensive. After a successful experiment in the town of Woerden in May 2004, retailers in the whole of the Netherlands have been permitted to round cash transactions to the nearest five cents since September 2004. New Zealand 1990 to 2006 From 1990 to 2006, the 1- and 2-cent coins were no longer legal tender, but 5-cent coins were. From 2006, the 5-cent coin was no longer legal tender. Peru 2011 onwards The one-céntimo coin was removed from circulation on May 1, 2011. Singapore 2011 onwards Always rounded down. South Africa 2002 onwards Rounding is done to the nearest 5 cents. Switzerland 2007 onwards The 1-centime/Rappen coin was still produced until 2006 and legal tender until 2007. Turkey 1 kuruş coins are still legal tender. Vietnam 500 dong notes are uncommon but sometimes used. Prices are usually rounded to 1,000 dong, with small candies or pieces of chewing gum given as compensation for rounding up. Prices are rounded down to the nearest multiple of 5 cents for sales ending in: 1¢ & 2¢ (rounded to 0¢); and, 6¢ & 7¢ (rounded to 5¢). This is done, for example, in Canada. Prices are rounded up to the nearest multiple of 5 cents for sales ending in: 3¢ & 4¢ (round to 5¢); and, 8¢ & 9¢ (round to 10¢). This is also done in Canada, for example. Values ending in 0¢ or 5¢ remain unchanged. 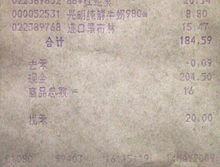 Chinese receipt showing the total being truncated by ¥0.09. This is currently used in New Zealand, which eliminated its 5 cent coin in 2006. This is also the case in Hong Kong, which eliminated its 5 cent coin in 1989 and 1 cent coin in 1995. In practice only utility bills, petrol stations and banks still keep the cent. All other businesses use only ten cent intervals. it is up to the business to decide if it will round 5¢ intervals up or down. The majority of retailers follow government advice and round it down. In Sweden between 1985 and 1992, prices were rounded up for sales ending in 5 öre. In the People's Republic of China, coins smaller than ¥0.10 are now rare though still valid. As a result, many shops simply truncate their bills down to the next ¥0.10 increment, giving the customer a discount of up to ¥0.09; however, many other stores round sales to the nearest ¥0.10 values, and ¥0.05 is usually rounded up. In Israel, 5 agorot coins were removed from circulation on 1 January 2008, after 1 agora coins had already been removed in 1991. Transaction amounts can still be specified to the nearest agora. Cash purchase totals are rounded to the nearest 10 agorot. A 5 agorot total is rounded up to 10 agorot. Sales ending in 1–24 öre round down to 0 öre. Sales ending in 25–49 öre round up to 50 öre. Sales ending in 51–74 öre round down to 50 öre. Sales ending in 75–99 öre round up to the next whole krona. In practice, the proportion of transactions rounded upwards is greater, due to psychological pricing of items ending in 90–99 öre. Rounding is only done on the total sum of a purchase, which makes that effect smaller. In some shops, all prices are already rounded to the whole krone, so that no rounding takes place. The system used in Sweden since 30 September 2010 and used in Norway since 1 May 2012. Sales ending in 1–49 öre/øre round down to 0 öre/øre. Sales ending in 50–99 öre/øre round up to the next whole krona/krone. ^ Stevens, Michelle (19 October 2015). "Ireland set to roll out cash rounding". FStech. Retrieved 20 October 2015. ^ "How to use Cash Rounding". Lightspeed POS Support. lightspeed. Retrieved 20 October 2015. ^ "Swedish Rounding". NZmaths. New Zealand Ministry of Education. 2010. Retrieved 23 October 2015. ^ "Man comes out 89 cents richer after a year of penny-rounding - Montreal - CBC News". CBC.ca. 27 May 2014. Retrieved 20 October 2015. ^ "Phasing out the Penny". actionplan.gc.ca. ^ "Hallituksen esitys Eduskunnalle rahalaiksi ja laiksi Suomen Pankin ohjesäännön 17 §:n muuttamisesta - Hallituksen esitykset - FINLEX ®". finlex.fi. ^ "Laki euromääräisten maksujen pyöristämisestä 890/2000 - Ajantasainen lainsäädäntö - FINLEX ®". finlex.fi. ^ Central Bank of Ireland. "Central Bank of Ireland - Central Bank announces rollout of rounding of 1c and 2c coins nationally". centralbank.ie. ^ a b "Rounding of cash transactions". citizensinformation.ie. Ireland: Citizens Information Board. 31 August 2015. Retrieved 20 October 2015. ^ a b "Cancellation of the 5 agora coin" (in Hebrew). The Bank of Israel. 1 January 2008. Retrieved 4 September 2016. ^ Castle, Stephen (15 September 2004). Written at Brussels. "Smallest Euro coins dropped by two nations". The Independent. London. ^ "History of New Zealand Coinage". Reserve Bank of New Zealand. Archived from the original on 23 January 2009. Retrieved 28 November 2015. ^ "Cessation of minting of 1 & 2 Cent Coins". South African Government Information. 22 March 2002. Archived from the original on 4 June 2011. Retrieved 14 August 2008. ^ "Change for the Better: Questions and Answers". Reserve Bank of New Zealand. Archived from the original on 6 October 2011. Retrieved 28 January 2009. ^ "New rounding rules". Danmarks Nationalbank. Archived from the original on 24 April 2010. Retrieved 2 May 2010. ^ "Regulation relating to withdrawal of 50-öre coins as legal tender". Norges Bank. Archived from the original on 17 May 2011. Retrieved 9 May 2011.